This is how most of my days start when I am travelling to one of my exciting client gigs or trainings around Germany, Switzerland, Austria and sometimes the BeNeLux countries. That excitement of “Where am I going next?” and “What will this day bring?” never drops because each day in the life of a “digital nomad” is different, and no two days are the same. 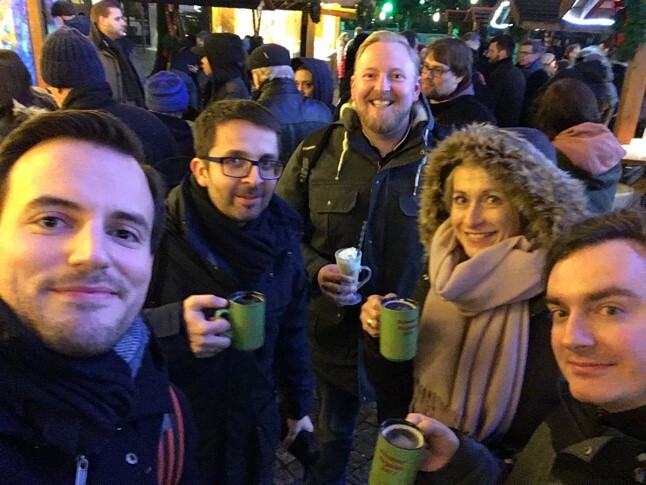 I chose to live in Bonn, Germany, two years ago, right before I started working with InterWorks. I did so because most of my friends live here. and Bonn, the “little brother” and neighbour city of Cologne (one of the major and most exciting German cities), is a great place to live and surrounded by beautiful nature. This is also one of the biggest advantages of being a digital nomad: you can choose where you want to live. The only requirement for your home base is a solid Internet connection, as well as some kind of mobility that gets you to all the places where you are working. This is why my team is spread out over Germany and the Netherlands (Berlin, Frankfurt, Düsseldorf, Nuremberg, Amsterdam and Amersfoort). Once I sit in the taxi that takes me to the train station, I check the news and the few emails I’ve received. As a company that works mostly remotely, we have spent a lot of time and effort figuring out the best, least stressful way to work remotely, which is why we use tools like Slack, Zoom and Salesforce to organise our communication. This saves plenty of time and emails (there is an interesting Washington Post Article on how much time we spend on email). Once I arrive at the train station, I board the high-speed ICE train. Another great thing about being a digital nomad, or travelling consultant, is that I can mostly choose how I get from A to B as long as it is reasonable. For my part, I love travelling by train. It is most often cheaper than flying, you travel with zero emissions, and you have enough space and good enough Wi-Fi to work comfortably or watch a TV show on the onboard entertainment system. From Bonn, it takes about 2-3 hours by train to get to places like Frankfurt, Stuttgart or Amsterdam or by plane to places like Berlin, Vienna, Zurich or Munich. As you can imagine, I travel a lot, but there are lots of little aspects that can make travelling more bearable: knowing how to combine modes of transport to reduce waiting times; knowing your favourite hotel (chains); owning noise-cancelling headphones (! ); and discovering your favourite restaurants all over the place. Having arrived on the client site, I start off with a face-to-face meeting with the stakeholders of our project to discuss which challenge we want to tackle next. Depending on the client, during such a meeting, I am working with cloud-based tools like Trello, Jira, Smartsheets or Google Drive to manage projects, organise our work and track progress. The cloud has really made working remotely possible and easy. 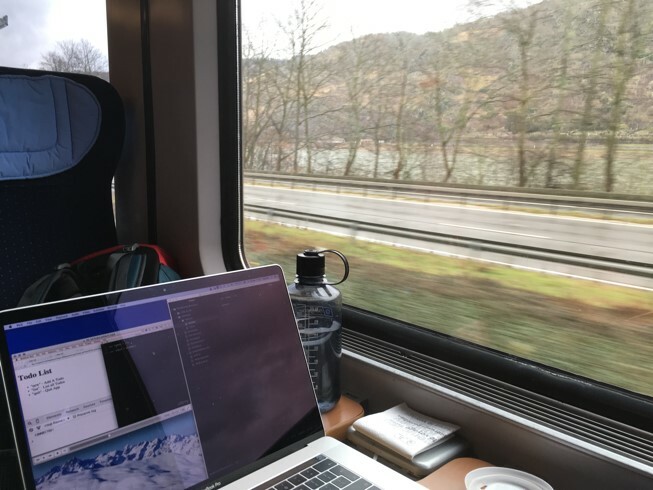 You can take your work wherever you want as long as there is an Internet connection. Furthermore, you are not limited to office spaces and network cables but can work from a café, airport or even some village in the Alps. Back to my day … After that first meeting with the project stakeholders, I sit together with the analyst to start developing ideas, formulating questions and creating dashboards. How this is done and how long it takes depends, of course, on the project scope, client size and availability of data and people. Hence, this process can range from a few hours to a couple of days. In the afternoon, I have my weekly one-on-one meeting with my team lead, which is done via the video conferencing app Zoom. Of course, it is different to talk to someone in person because you make real eye contact, and you don’t just see a small portion of that person’s surroundings. However, you do get used to having these meetings on your screen. Also, options like screensharing facilitate showing one’s work to someone else. My team lead and I talk about how our projects are going, if there are any difficulties or issues, and we are brainstorming about the team Hackathon we have planned for our next team meeting. Although I don’t see my team lead and colleagues in person that often, we have plenty of opportunities to get together, like our quarterly team meetings, the Winter Conference and many more events. After some more time with the client, at around 17.00h, I pack up my stuff and leave for the train station to return home. Depending on how far away from home I am and how many consecutive days I am travelling, I often stay in a hotel, but today I am taking the train back home. I use the time on the train to respond to some Slack messages I received during the day and listen to my favourite podcast. Staying at a hotel can be very nice as well, as there is so much to do in most of the places I visit, whether it be going for dinner with a colleague or friend, going for a hike, run or swim, or attending a concert. I arrive back home for dinner with my friends and am already looking forward to what tomorrow will bring! 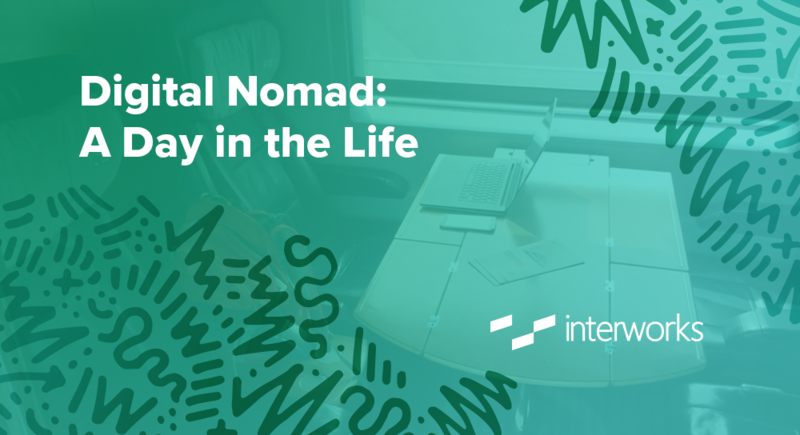 The post Digital Nomad: A Day in the Life appeared first on InterWorks.